Reminiscing moments spent with the Lord, ruminating on His words, and deliberating on His messages are amongst the most liberating experiences. 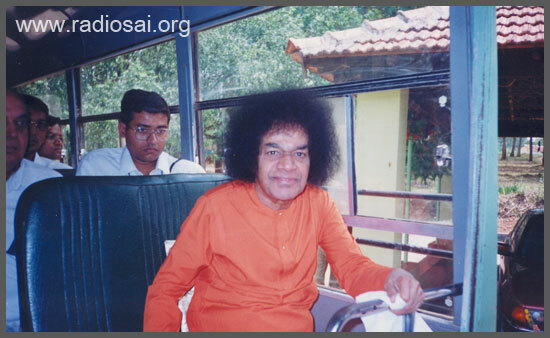 For many years, starting from 1986, Bhagawan visited the hill station of Kodaikanal in the summer months of April-May along with a few boys and elders. And those who have been blessed with this singular opportunity can never thank their stars enough, for it was an opportunity of a lifetime! Imagine living and sleeping just outside Baba’s room! The Lord could come out at any moment and surprise you! Imagine Bhagawan standing next to you in the middle of a crowd and posing with you for a lovely snap! Visualize Swami suddenly leaving His car and getting into your bus and mesmerising you with scintillating stories during a picnic amidst the lovely mountains. Kodaikanal was the Lord’s playground. Think of the Kohinoor diamond and the very next minute the Lord has it in His hands! But His actions in Kodaikanal are not meant to be taken as mere play - His every little gesture and act had a profound lesson not only for those who were physically around Him, but for entire humanity. As part of the Thursday Live programs on Radio Sai, on June 7, 2012, Radio Sai's Bishu Prusty spoke to four former students of Bhagawan’s educational institutions. Presented below is the adapted transcript of a part of the conversation with two of them, Dr. T. Ravi Kumar, the current warden of the Brindavan Campus of Sri Sathya Sai Institute of Higher Learning, and Mr. Ruchir Desai, Assistant Professor in the Department of Commerce in the same campus. 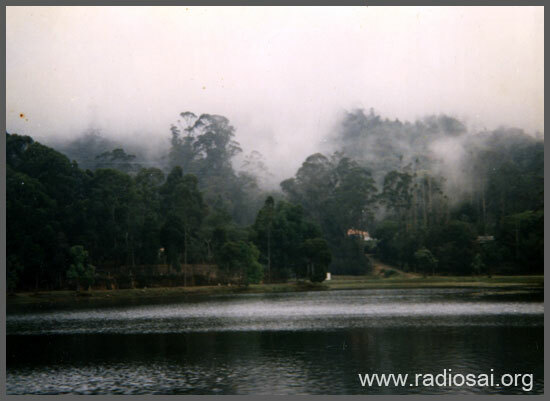 RS: Dr. Ravi Kumar, can you please recount for us your memories of the very first trip to Kodaikanal - way back in 1986. Dr. Ravi Kumar (RK): Thank you for this wonderful opportunity. It all started in the summer of 1986. That was a particularly hot summer and there were about sixteen of us, research scholars, working on our projects in the heat of Puttaparthi. Our guides had gone for their vacation and Swami was in Brindavan. One night I complained to Bhagawan in my mind, “Swami, it is unbearably hot and I need an outing…” and drifted off to sleep. A couple of days later a beautiful film was screened in which I saw Swami in a very beautiful environment with lot of greenery and colourful flowers. It looked like a forest, but in the background there were quite a few buildings. I wondered where this place was - was this paradise on earth? I prayed that one day I should get a chance to see Swami in such a setting. Little did I realise that this would really come to pass. The Lord hears even these most silent prayers. It was in the midst of such a summer that one day, unexpectedly, it rained and the mercury plunged. We were wondering how this untimely rain suddenly came about when we heard the news that Swami was coming to Prasanthi Nilayam the next day - and Puttaparthi obviously was trying to get ready to receive the Lord. The next morning Bhagawan came to Prasanthi Nilayam. As there were only a few of us, we imagined an almost empty Mandir. But we were wrong! The Mandir was full. RS: Oh! Somehow the word had gone around. RK: Yes, and as Bhagawan got down from His car He looked at us and said, “I will speak to you tomorrow morning.” Needless to say we were very happy. The next morning Swami called all 16 of us into the interview room. He said, “This has been a very hot summer.” We all nodded in agreement - Swami was telling what we felt deep inside. RS: Oh my God! What a surprise! RS: Just the good news. But the student who had complained said, “Our classes begin in a week. We have our teaching assignments. Where is the chance this year?” However, we consoled ourselves saying that Swami loved us very much – He had come all the way from Brindavan, took us into the interview room and spoke to us. We all knew that once Swami states something, it will happen. RS: In just two hours? RK: That is how Swami’s methods are. He had given us detailed instructions about things to get from the store room, such as sleeping bags and warm clothes, which we would use in Kodaikanal. We boarded the bus and were soon in Brindavan. Puttaparthi was extremely hot. We expected Kodaikanal to be very cold. But to our surprise, we found that there was an unexpected downpour in Brindavan and it was very cold. This was very unusual for that part of the year. We thought that was Swami’s way of acclimatizing us for the trip ahead. RK: I’m sure that the God of Rains, Lord Indra heard it because when we landed in Kodaikanal the rain had just stopped. We stayed there for 8 days. On the final day Swami asked us to visit the Palani temple of Lord Muruga. Swami said, “You pray at the temple and then proceed to Coimbatore. I will start a little later from here and I will join you on the road.” So we started off early. Later we heard that it soon started raining again. That is how meticulously Swami plans to give us opportunities. During our stay a very beautiful incident happened. Swami had just returned from a drive around Kodaikanal. He called to us and said that there was a young boy near the boat club who was selling hats. An elderly devotee interjected that summer was over. But Swami was firm, “It doesn’t matter. You don’t need the hats, but he needs the money.” Then He asked us to go. When we reached the spot the boy was pushing his cart home. He must have been surprised to see 16 to 18 boys running towards him. When we reached the spot and asked him about the hats, he was very surprised – and happy. He said he had not sold a single hat over the past 15 days. We asked him the price, he said that though each hat was about Rs.20 – 25, since it was ‘out of season’ he would give it to us for Rs. 15 each. But we insisted that we wanted to buy it for Rs. 25. He must have thought we are a set of mad boys because nobody buys like that. But when you’re in touch with the Lord of Love this is how things work. Money has a very little place in one’s life, Love takes precedence. As we bought the hats, we casually asked him if he has heard about Sai Baba. The boy’s face lit up. He opened his small wallet and drew out a small newspaper clipping of Swami. He said that he prays to Sai Baba every day. While we were returning, we saw Swami’s car approaching us. We ran towards Him. As Swami rolled down the window, it started drizzling very slightly. Swami asked us to wear the hats saying, “Wear the hats, good for rain!” Swami wanted to show us His omniscience. He showed us his omnipotence by directing Lord Indra to keep the rains on hold. More than anything, that day He showed us a glimpse of His immense love for humankind. The fortunate group of research scholars and students who accompanied Swami on the first of the many Kodai trips. The boys are seen wearing the straw hats mentioned in the story. RS: That was indeed a touching story of His selfless Love. And experiencing all this in Kodaikanal where Nature is in its pristine form is such a blessing! Mr. Ruchir Desai, you have also had the chance to travel with Swami to Kodai many times. Could you please share your memorable moments? Mr. Ruchir Desai (RD): There are many memories and it is difficult to know where to start. When it is about Swami, your mind is flooded with memories and emotions. But let me share one particular incident that has been a very strong lesson - an eye opener - for me. 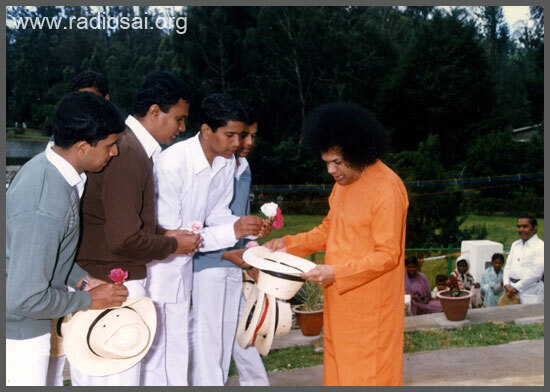 Every year when Swami went to Kodaikanal He would conduct Narayana Seva at least once. During the 80s and 90s, He used to spend over a month there. I remember my first trip lasted over a month and a half! We left during the first week of April and returned to Brindavan only in mid-May. In such long duration, we had more than one Narayana Seva conducted – one on April 26, the anniversary of Trayee Brindavan, and the other on Easwaramma Day. Sometimes, we would have more. Narayana Seva in Kodaikanal is very special because it is not just food being served to the poor, it is actually Divine Prasad. Hence, even devotees assembled partake it. Students and Swami’s guests were given opportunity to fill devotees’ plates, carry food-laden vessels along the lines and serve. The poor were also given clothes. As Kodaikanal was a hill station and hence, a cold place, the clothes distributed would consist of a saree for the women, a dhoti for the men and a thick blanket for both. One day, during Swami’s visit to Kodaikanal, a Narayana Seva was scheduled on a certain day. The place, food, clothes, the serving boys and everything associated with such a grand event was planned. Food was served to all and the clothes along with blankets were distributed. Swami personally went around distributing clothes to everyone. Swami walked all the way up to the entrance and down the steep driveway distributing the clothes to everyone gathered there. Finally Narayana Seva drew to a close. The boys and elderly guests had partaken the prasad too and were seated around Swami’s chair eagerly expecting Him. Swami went about enquiring whether everyone had food and was satisfied. He walked around and saw a pile of blankets kept in a corner. He asked, “Were all the blankets given?” He turned around and asked an elderly devotee to enquire whether everyone received clothes. A couple of minutes had passed, the devotee had not returned. He looked impatient. I was standing next to Swami – He turned to me and told me to find out. On the way I met the elderly devotee. We both went to the gates again and enquired. Satisfied that everyone present had received the clothes and blankets, we returned to Swami to present our report. Swami had a very focused look on His face. He got up and went into the kitchen. We all knew now that something was amiss – something that Swami did not approve. When it comes to work, Bhagawan is a very hard task master and nothing less than perfection satisfies Him. So was something wrong? It sure seemed so. Swami walked all the way up to the end of the kitchen, talked to a senior devotee who used to accompany Swami on all His trips and looked after the kitchen and hospitality. He then spoke something to one of His drivers and turned back. We all froze. The atmosphere inside Sai Sruthi was intense. Everyone was, in the clearest terms, certain that something had gone wrong. Swami had come to the front when the driver showed himself at the door. He didn’t say anything. On seeing his face, Swami stood up and walked out. He asked one of the elders to go with Him, then got into His car and drove off. He was escorted by another jeep that contained a couple of policemen. For 45-50 minutes those of us in Sai Sruthi had no clue about what was happening. And then He came. Usually students would rush to open the door and be greeted by a Divine smile. But not today. No one came out. They were all so scared. Not even the elders moved. Why was the Lord so serious? Ultimately I realized that I needed to go and open Swami’s door more as a sense of duty than anything else at that time. With much trepidation, I opened the door only to be greeted by – the most beautiful smile I had ever seen! I did not know how to react to that smile. Swami walked into the drawing room of Sai Sruthi with that big beaming smile on His face. Everyone in the room was electrified because Swami was smiling! That’s all everyone wanted. We knew that everything was alright. The Earth was back on its axis. If you retrospect, Swami, before His mysterious trip, had brushed aside the glass of water saying, “No. Not this.” His messages are sometimes very cryptic. Swami didn’t say anything then. It was only after lunch and when Swami had retired to His room that we got to understand the full story. When Swami said He was thirsty, He meant it in a very different sense. Bhagawan was not happy because despite the complete distribution of food and clothes to all who had come, there still were a few piles of blankets. And He did not like this. Bhagawan later explained that He had instructed the driver to load all the remaining bundles of blankets in the jeep and car and rode across Kodaikanal. He then directed the personnel in the jeep to distribute blankets to all the old people across the hills – all old men and women who were not aware of the Narayana Seva and those who could not make it as transport was scarce in the hill station. Swami drove into every lane and bylane looking for people to give the blankets. 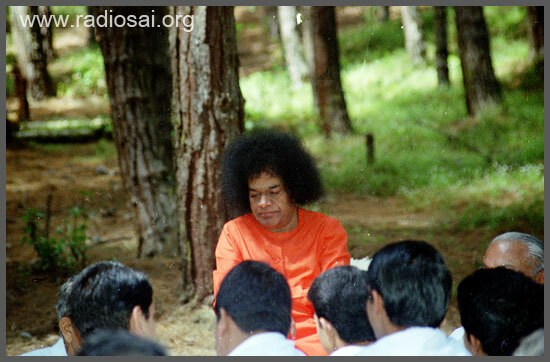 There were times when Swami spotted someone who was a few hundred meters away in a hilly area and then He would instruct the jeep behind Him to stop and somebody from the jeep would pick a blanket, run behind the person and give a blanket. Finally Swami’s 'thirst' was quenched. 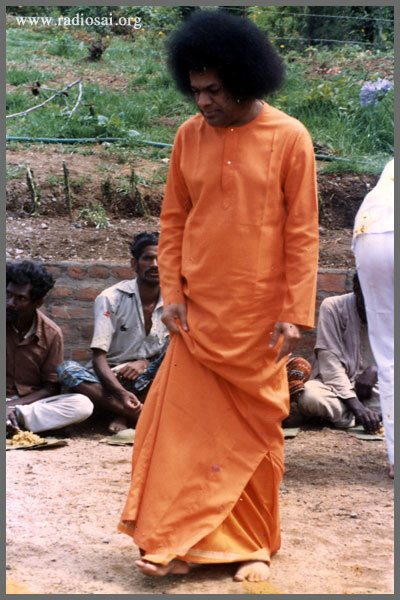 Swami was satisfied because He had finished the entire pile of blankets Himself - personally going around Kodaikanal and distributing those blankets. Bhagawan mentioned that the people who were in actual need of the blankets were not only those who come there, but also those who were unable to come. “So I had to go and give them the blankets in their place,” He said. We might have kept those blankets to be distributed next year. But for Swami, that was not enough. He taught us that satisfaction lies not in giving to all those who come to our doorsteps, but in finding the true meaning of Narayana Seva, which is to search out for people who are needy, people who deserve and make the effort to go and give them because it’s when you give someone who is really needy that you have fulfilled the objective. RS: Truly, only if we develop this kind of thirst... thank you very much.